T-Bolt Band Clamps provide leak-proof connections in a wide variety of industrial applications. Our clamps are 300 series stainless steel with rounded band edges to protect soft hose materials. 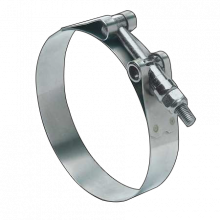 These T-Bolt Band Clamps provide high tensile strength, durability, and corrosion resistance. 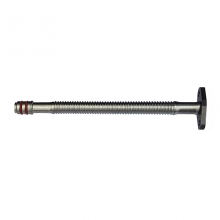 They are the perfect choice for medium and heavy-duty applications. T-Bolt Band Clamps are frequently installed on coolant and air-intake systems for a construction vehicle, truck, and bus engines. IMPORTANT - Our Stainless Diesel silicone boots are 5-ply thickness (much thicker than others to handle the boost of diesels). When choosing the size needed to fit our boots, you must go up a half inch to allow fitment. T-Bolt Band Clamps provide leak-proof connections in a wide variety of industrial applications. Our ..